Every organism on this earth serves a purpose, even ticks. But try as I might, I can find no love for these parasitic creatures and I certainly don’t want to find one on me. Unfortunately, I attract them. After just a few weeks of gardening this spring in a community garden set into a young forest preserve, I had already found dozens of ticks crawling on my skin, my clothes, and even on my bathtub. But even with the closest examination of my skin after gardening, there were just so many ticks that bites were pretty much inevitable. I removed three dog ticks and one deer tick from my skin in a span of two weeks. At first I thought I would just have to co-exist with them for the season. I would keep spending time poring over my skin and clothes every time I left the garden (and obsessively checking over my legs and arms every ten minutes every time I was out there) and hope that I would keep catching them early on once they latched onto my skin so that I could remove them before they had any opportunity to transmit any of the diseases that ticks can potentially carry. But the day I found the deer tick, as small as a speck of dirt, was the day I decided I wouldn’t find anymore ticks latched onto me this season. I had a similar experience a few summers ago, when I stayed for the summer in a small farming village on the top of a mountain in Slovakia, camping out under a tree most nights and spending most of my days in gardens and collecting herbs from tall grassy meadows. Tick removal had been a daily activity. On telling one of my friends there, he suggested that I start taking a Vitamin B complex because he heard that ticks don’t like the smell. The next day, I walked the mile+ down the mountain to the nearest road, got on the next bus to town, bought a pack of Vitamin B and a bottle of mineral water and took my first B vitamin right there in the store. The next day, I got no ticks. Remembering my experience there, I bought the first plant-based, naturally derived B complex I could find and took the first one right in the parking lot outside of the store. Since then (almost 2 months) I have only found one single tick on me and it did not bite. Now, Vitamin B has not been proven effective scientifically as a tick or insect repellent, but I believe 100% that it works for me, going from multiple ticks a day to zero in two different part of the world, at different points in my life and with different varieties of tick species. There are other methods of tick prevention, including simple physical preventative measures, essential oils and herbal sprays. None of these methods are guaranteed to work 100% of the time for all people, but each individual may find one (or some) that work for them. Avoid tall grasses. Ticks like to hang out on the tip of tall grass blades, waiting for a host to brush past so it can attach itself. If you do brush against tall grass or are walking through it, be sure to check your legs frequently for ticks (and moving specks of dirt). 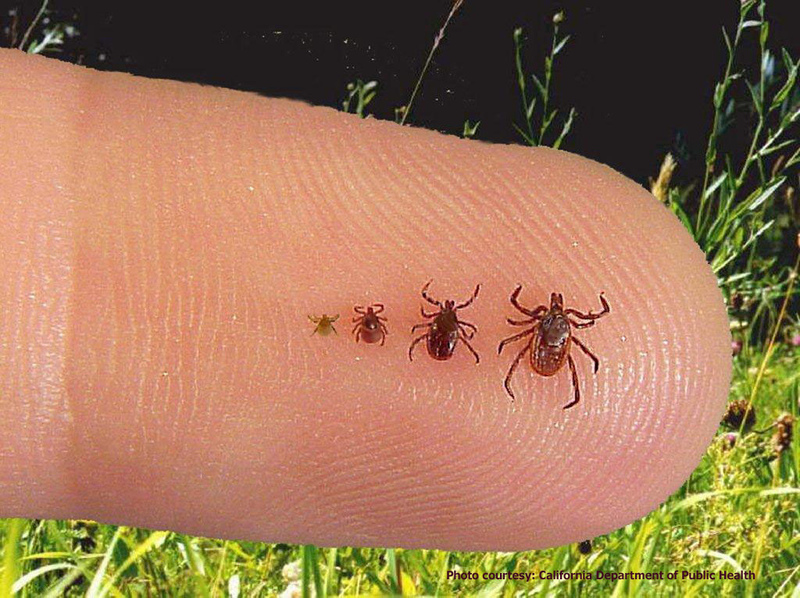 Mowing tall grasses and keeping brush clear in high traffic areas can help protect yourself and others from getting ticks and tick-borne diseases. Cover skin. When in outdoor or wilderness areas, especially areas with high amounts of tall grasses, wear long pants and long sleeves. Tuck shirt into pants and pants into socks. People with long hair should tie it back, tuck the ends it into their shirt and wear a hat. Some people swear by Vitamin B, and specifically B-1, for tick prevention although it is not proven scientifically and does not work for everyone. Perhaps it varies by individuals as it interacts differently with each person’s unique physical makeup. I look for non-synthetic, all-natural, plant-based vitamin B complex. It is said that once in your bloodstream, the smell of vitamin B, undetectable to yourself or other people, is offensive to ticks and other insects and keeps them off your skin in favor of a more desirable host. Essential oils that are known to repel ticks include neem, eucalyptus and lemon eucalyptus, citronella, rose geranium, lavender, pennyroyal (aka tickweed) and a number of mint oils. Please research any essential oils before using them, especially if you are pregnant. Some essential oils can be harmful to pregnant women and also to cats. In order to use essential oils for tick prevention, they must be diluted. As oils don’t dissolve in water, the best media for diluting them are cooking oils, alchohol or witch hazel. Check out the specific recipes listed below. Pre-mixed essential oil blends are also available. One mix that comes highly recommended from an herbalist and Holistic Health Care Practitioner who is working closely with Raíces, Silvia Morrison, is “Purification” from the company Young Living. It contains citronella, lemongrass, rosemary, melaleuca, lavender and myrtle and has very positive testimonials and reviews from consumers. Use almond oil to dilute the oil as it contains sulfur and ticks are repelled by the smell of sulfer. Use soybean oil as the base of your oil mixtures. Soybean oil is an insect repellent and is sometimes even used as a pesticide. Wash with Dr. Bronner’s peppermint soap every day. Mint is also a tick repellant and small amounts of it and its scent will stay on your body. Roll pant legs up one fold and sprinkle sulfur into the cuff. This should deter any ticks that end up on your feet from crawling up your pant legs.